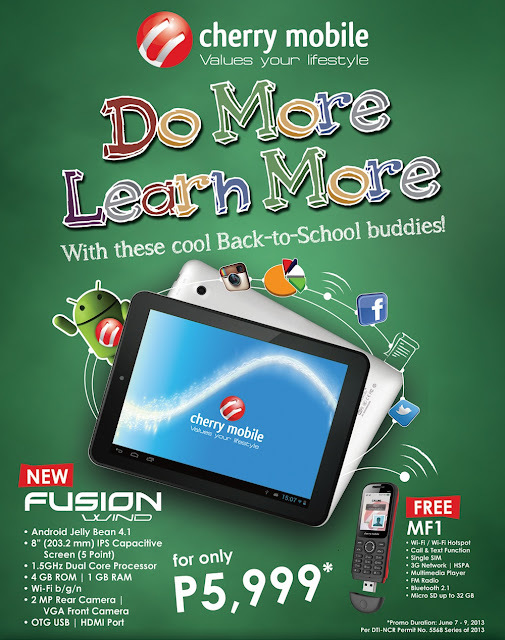 The fourth installment for the Cherry Mobile's Fusion tablet series comes with the Wind. Following the footsteps of Ice, Bolt and Fire, the Fusion Wind poses a great threat to any other local tablet there is. Despite getting shorthanded for being a dual-core device, the Wind proves that it is an effiecient worker with its 1GB of RAM and Android 4.1 Jelly Bean. The Fusion Wind is introduced under Php 5999 price tag which makes it one of the affordable 8-inchers in the local scene. Cherry Mobile has also bundled it with a a CM MF1 (portable phone, USB WiFi hotspot plus 3G dongle which costs Php 1,799) in that price tag with promo running from June 7 to 9. Other specs include 4GB internal memory, 2MP main camera (VGA secondary) and USB OTG. So those who wanted a decent tablet but can't have the luxury to spend extra cash for the likes of Galaxy Note 8.0 and iPad Mini, Cherry Mobile Fusion Wind is a better alternative.